If you’re as serious as I am about growing your own food you might be considering extending your season with a fall garden. Maybe you’ve never heard of fall gardening or season extension; maybe you think the whole idea is absurd? Here in Maine, many old-school gardeners don’t plant til Memorial Day; they spend their summers in a flurry of harvesting and canning, are done with the garden by October and eat canned or frozen vegetables the rest of the year. If that’s the case you’re missing 3 seasons worth of gardening when you could potentially be producing fresh vegetables to feed yourself and your family. That’s right, you can garden through ALL the seasons with just a little strategic planning. Read more about my Real Food Challenge! Extending your season simply allows you to grow more food. It allows you to eat fresh vegetables longer, which is healthier for you because they’re higher in nutrition than canned or frozen foods. Whether you’re striving to stretch your food budget or working to increase your own self-reliance, a fall garden is going to offer you the opportunity to grow fresh vegetables later into the fall and winter. #1 Know your expected first-frost date: Knowing when to expect that first frost in the fall allows you to determine when to plant a crop─or even if there’s time for a particular crop. If you’ve been gardening for a few years you may already know when to expect frost, but if you’re new to gardening you can ask a fellow gardener or use this free online calculator from the Old Farmers’ Almanac. It’s important to know the number of days it takes for each vegetable to mature. #2 Look for days-to-maturity on seed packets: Most seed companies include growing information specific to the breed and variety on the back of the seed packet. Knowing the days-to-maturity of the crop you are planting allows you to time the sowing of your fall crop. 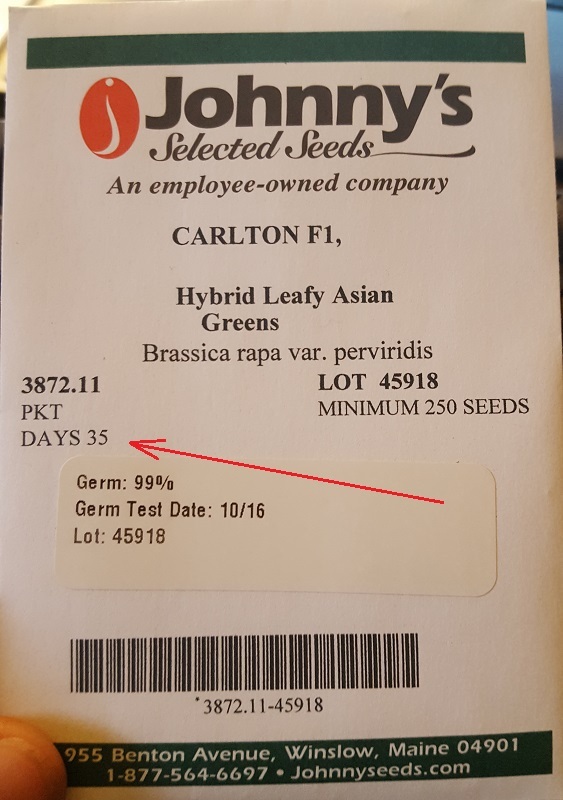 If you can’t find that info on the packet you can usually find it on the seed-company’s website or you can even google the crop to get an idea of when to expect to be able to harvest the crop. #3 Use a calendar to count back: Take the number of days-to-maturity and beginning on your first expected fall-frost date, count back on a calendar to find out when you should sow the crop. #4 Utilize free online sowing calculators: There are a number of online calculators you can use to help with scheduling the sowing of your fall garden, including the Fall Harvest Planting Calculator available in the Planning Tools & Calculators section on the Johnny’s Selected Seeds website. These kinds of tools make planning easy and they’re free to use. 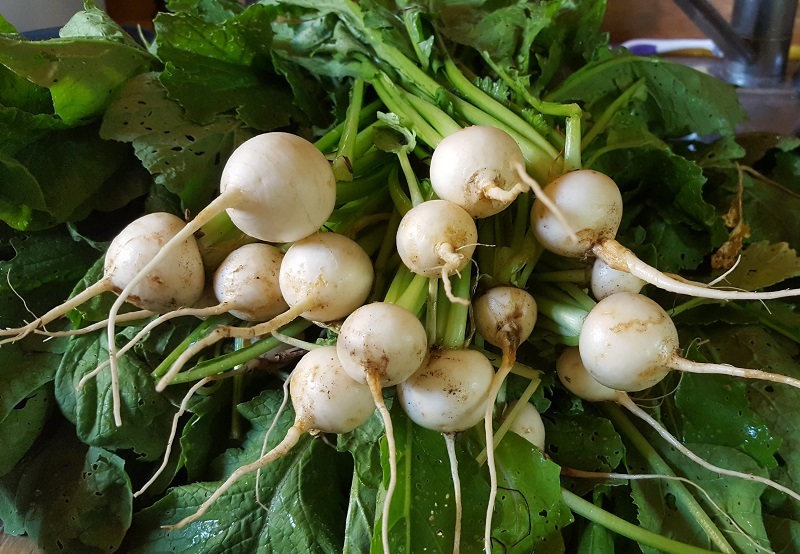 These hakeuri turnips are easy to grow and have a short number of days to maturity. One of my favorites! #5 Select cold-tolerant crops: Some crops thrive in the heat of summer (tomatoes, peppers, squash, etc. ), while others do better in the cooler temperatures of the spring and fall. Typically that’s the roots and greens family, brassicas and peas; that’s a lot of different kinds of vegetables that you could be growing. Check out the selection of recommended varieties for Summer Planting for Fall Harvest at Johnny’s. #6 Think long-term: Plan your garden strategically, with the intention of following a spring or summer crop with a crop for the fall. For example: I have a bed of lettuces, radishes and turnips I had planted first thing in the spring that is now finished producing those crops. I’ll sow my winter storage carrots there and I can cover them with agribon to grow them late into November. Soon these lettuces will be done and I will plant carrots in their place! #7 Keep it moist: Getting some of these cool-weather loving crops to germinate in the heat of high summer can be tricky even to the most experienced growers. Don’t let those beds dry out─maintain consistent moisture levels─and timing a watering around 10 or 11 in the morning can help to keep the soil temperatures low enough that those seeds can take root. #8 Employ season-extension tools: You can grow so much with just a few wire hoops and a length of Ag-19 row cover for frost protection that it’s well worth the investment. 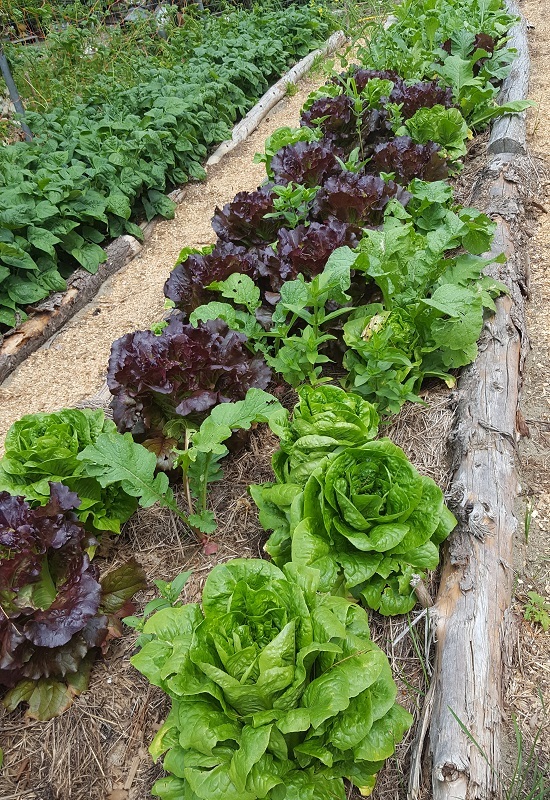 To learn more about using row-cover to extend your growing season check out this article I wrote called: Agribon in the Garden. Watch for Johnny’s annual sale on season-extension supplies to catch a break on the price of the row-cover itself; they usually run that sale beginning in September. 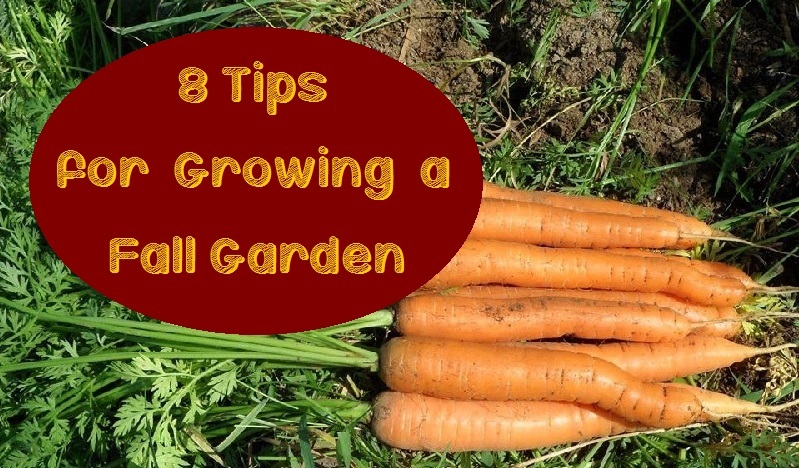 Just imagine how much more food you could be growing with a fall garden! Whatever the motive behind your garden, it’s easy enough to continue growing fresh vegetables later into the cold season. Why not give it a try and see for yourself? Have you grown a fall garden before? Feel free to leave a comment below to share your experiences with season-extension! Love this. Thank you. I have a summer garden this year and am having so much fun with it. Can’t wait to try a fall garden.